Crude oil prices are at the highest level in more than three years and are expected to keep climbing, increasing the cost of gasoline across the country. According to the Oil Price Information Service, the average gas price in the United States is currently $2.81 per gallon, up from $2.39 a gallon last year. Diesel fuel hit its highest national average price in more than three years at about $3.06 per gallon. 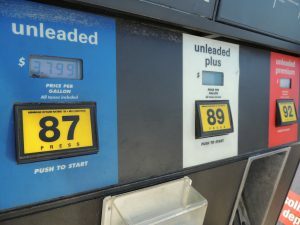 According to AAA, drivers in Western states, including California, Oregon, Washington, Nevada, Alaska, and Hawaii, are paying the most at the pump. In those states, the average retail price ranges from $3.19 to $3.61 per gallon. A motion picture lighting technician in Redondo Beach, California, reports he’s now paying about $3.39 per gallon. Average retail gasoline prices are lowest in states in the South and Southeast. Louisiana and Alabama have the cheapest gas in the country at $2.54 and $2.56 per gallon, respectively. In the Northeast, the average price for a gallon of regular gas in Long Island was $2.97 at the beginning of the week, 42 cents more than a year ago. Across the U.S., 16 percent of gas stations are now charging more than $3 per gallon. The price of U.S. crude oil has been on a mostly steady incline since last June, hitting nearly $70 last week. Oil prices near $70 are giving the energy sector and related industries more money to spend on equipment and workers but they are also boosting costs for some sectors of the economy. Industries that rely heavily on fuel, like shipping companies, airlines, and other transportation companies, are seeing their costs rise. American Airlines reported spending $412 million more on fuel in the recent first quarter than in the same period a year ago. Rising oil prices are projected to translate into higher gas prices come this summer. Gas prices tend to rise each spring through Memorial Day and slowly decline as the summer goes along. Some industry experts are saying that this will be the most expensive driving season since 2014. The U.S. Energy Information Administration (EIA) projects that this summer gas prices will average around $2.74 a gallon, up from $2.41 a gallon last summer. An average of $2.76 a gallon would translate into an additional $190 spent on fuel by the average U.S. household this year compared to last.